Geoffrey Hill, who died on 20th June 2016, was a great poet, a major poet. To celebrate him, we have pulled from our archive an essay published in The London Magazine in 1964 by Christopher Ricks. I believe, and so do many others, that Christopher Ricks is our greatest living critic (companion would be a better word) of poetry in English. He is also a scholar and an editor. Faber & Faber published his and Jim McCue’s edition of T.S. Eliot’s poems in 2015. Hill never quite caught on with the general reading public in the way of John Betjeman, say, or Philip Larkin or Ted Hughes. He never belonged to the ‘what oft was thought but ne’er so well expressed’ school. Although, like Ricks, he spent many years in the United States (both were on the faculty of Boston University, after our essay was written), his poems are grounded and local. This remains the case even when he tackles a wider field than the matter of Britain, as in King Log (1968) or The Mystery of the Charity of Charles Péguy (1983). He writes about the ‘middle kingdom’ of Britain. Mercian Hymns (1971) is an indicative collection. Like a French winemaker, his terroir is physical, historical and spiritual. He is an exemplar of Eliot’s phrase ‘the present moment of the past’. We need this badly as so many current upheavals in the world have identifiable historical analogues. History as event and history as evolving concept form the radioactive core of Hill’s poetry. This is why, beside poems that deal with ‘what happens to me and what I feel about it’, Hill’s work can seem complex and knotty. But it is beautiful and sensuous as well. He is an unignorable writer. When I sought Christopher Ricks’ permission to republish his essay, he told me that quite recently he found a copy of The London Magazine in a bookstore in Cambridge, Massachusetts. It was the very issue in which Alan Ross first published the essay. A flyleaf signature revealed it once belonged to Geoffrey Hill. 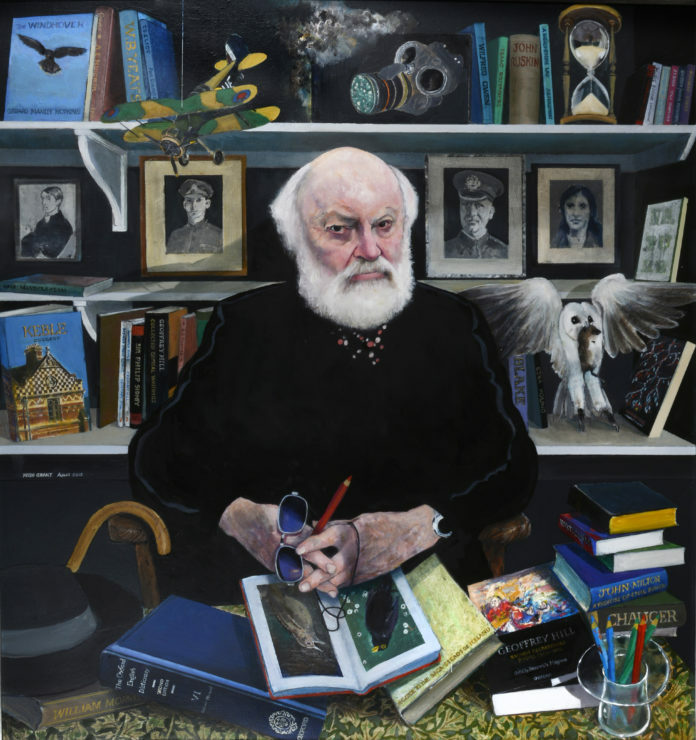 Of all our present poets, Geoffrey Hill is the one who most persistently tackles the problem of what to do about dead language, clichés, the phrases which have gone sour, flat, or heartless on us. Of course there are good poets like Philip Larkin whose approach and style make it appropriate for them to take no notice. And again there is Donald Davie who, after providing the best modern criticism on the subject of dead metaphors, has now come to believe that the worst enemy just now is not such deadness but frantic liveliness, verbal fidgets, a high-pitched buzz of interference. Yet all the same the restoration of clichés is by no means a form of antiquarianism. Conspicuous consumption and planned obsolescence are features of the linguistic as well as the social scene. Words and idioms are created and worked to death with a ruthless speed that would have shocked a nineteenth-century poet – the process resembles one of those eerie films which speed up a flower’s life from budding to withering. And the attempt to get the New English Dictionary up to date now recalls the doomed bustle of Tristram Shandy, falling further and further behind with its schedule because living is a brisker process than writing. If Eric Partridge were now compiling his Dictionary of Clichés, the result would have been a far fatter book. All of which means that we ought to take particular notice of a poet like Mr Hill who persists in his renovations with intelligence and passion. (And who writes some excellent poems meanwhile.) Anyone who thinks that there is still plenty of unspoilt language around, huge virgin forests, will find morbid any such dread of the dustbowl. The land-rich English used to be able to to laugh at the Dutch: ‘They with mad labour fish’d the land to shore.’ Now that ours really is a tight little island, the Dutch seem sane. One says ‘renovations’, because the poems in Hill’s For the Unfallen and Preghiere are very different from those that simply incorporate clichés in order to be matey. Like everyone since Wordsworth, Hill agrees that it is necessary for poetry to be in a vital relation with the living speech of its own time. But he has argued, quite rightly, that this is not at all the same as believing that poetry need be chatty or full of gnarled rusticities. It seems to be a modern scholastic fallacy that ‘living speech’ can be heard only in the smoke-room or in bed; in fact the clichés and equivocations of propaganda or of ‘public relations’ are also part of the living speech of a society. Soft comings-on, soft after-shocks of calm. Gather the dead as the first dead scrape home. ‘Scrape home’ is a triumph. It is unforcedly literal, ‘scrape’ showing the dead body as like a keel that runs ashore, and ‘home’ being nothing but the truth. And in the gap between such a way of scraping home and our usual application (just winning, just safe, gulping with relief) – in that gap is the appalling heartbreak of the poem, the gap between what we expect of life and what we get. Pathos with dignity – there are not many poets now writing who can so command the combination. But it would be as well to quote from Hill’s essay on Ben Jonson to show that such effects are not accidental. In Marvell, as in Jonson, the perspective requires the utterance of deliberate cliché, but cliché rinsed and restored to function as responsible speech….Jonson’s language is frequently ‘literary’ in the best sense of the term. That is, its method requires that certain words and phrases, by constant repetition in popular literary modes, shall have been reduced to easy, unquestioned connotations. These connotations are then disturbingly scrutinized. Pope’s ‘Oblig’d by hunger and request of friends’ requires for its effect the common formula of gentlemanly apologia, on the part of coy amateurs bringing out verse. It is ‘hunger’ that blasts the cliché into a new perspective. And if anyone still doubted that Hill’s words were apt to his practice, it would be necessary only to quote the extraordinary (and fascinating) notes which he provided for the revised edition of Kenneth Allott’s Penguin Book of Contemporary Verse. But priceless, and harmless to the nation. ‘Catches his death’ is certainly shockingly tasteless in its evocation of the common cold, but who could deny that it is altogether accurate as a description of Sebastian’s way of death? And if it first of all tells the truth, what is the objection to its being shocking? Added to which, ‘catches’ certainly doesn’t sneer at the martyr, since it implies his decisiveness, his skill, and his power to will what God wills. The key-word is, of course, ‘grotesque’ – a range of conflicting emotions which is at work again on ‘a little flutter’. Once more this is both literally accurate and desolatingly inadequate in its reduction of martyrdom to a petty thrill. (The rhyme martyr/flutter flaps with grim limpness.) The climax of these contrarieties is ‘priceless’ – is there any other epithet which we apply quite casually both to an invaluable work of art and to a preposterously comic situation? The woundingly comic effect here is achieved by a method resembling that which Hill pinpointed in Rosenberg’s poetry, ‘the skillful juxtaposing of elevated and banal diction’. Except that Hill outdoes this in skill, since we are given not juxtaposition but interpenetration: ‘catches his death’, like ‘scrape home’, is both elevated and banal. Hence the remarkable economy of Hill at his best. The ironic mode, as Yvor Winters has ruthlessly shown, is often a very wasteful one, since it spends words on doing something and then more words on undoing it. The simultaneous duplicity (in the best sense) of Hill’s poems is a very different matter. To see scull, coffin’d bones, and funeral stole. Hill to have written lines that do not just curl up and die when juxtaposed with Keats. Not but what James Dickey was pitching it a bit high when he said of Hill’s ‘Genesis’, ‘I can think of no better compliment to pay Hill than to say I was all but persuaded that, were God a very talented young poet, the six days of the Creation might very well have been as the poem says they were’. ‘Purely’: merely? with purity? The word refuses to plump. ‘Gifted’: talented? with a present? If his hands are empty, then such a saint is a bit of a disappointment; but then a conjurer is all the better for starting with frankly empty hands. What the context does is to give back to the ‘conjuror’ some of the dignity which he had in the old days when religion felt in no position to mock at magic – a conjurer used to be a man who could conjure up spirits. Dignity, but seen with a cold eye; the saint in the stained-glass window is a dubious figure (we are made aware of the doubt that lurks in ‘stained’). He is ‘a feature for our regard’: for our respect? or because he is nice to look at? The dubiety makes for a poem of great economy and tolerance. I would prefer Hill as a man to be in one (dismissive) mind about the saint, but undeniably on this poetic occasion two minds are better than one. In ‘Ovid in the Third Reich’, Hill has even been able to write a poem which says what can be said for those Germans who remained silent. The remarkable thing is that at the same time it says what must be said against them. Eloquence is saved from becoming oratory because of the way in which that second line teeters on the edge of a collapse into self-pitying despair: ‘Innocence is no earthly use’. But the (unspoken) cliché does offer a faint hope that innocence may be a heavenly weapon, or of heavenly use. Yet if the innocence of a German would not protect him, how much more must this have been true of a Jew? Too much upon the damned. ‘Look down’, with the uncertainty of ‘despise’ or ‘see from Heaven’ – and with a further uncertainty unfolding: is the reference to the traditional pastime of contemplating the tortures of the damned? Or are we speaking of a prudence at suffering? That way madness, or hardheartedness, lies. It is striking enough that Hill is able to write poems which say so much; what is even more striking is that the best of them are uncramped and unclogged, characterised indeed by an imaginative spaciousness. Serene even to a fault. ‘Even to a fault’ here blossoms wonderfully; it admits our doubts about an ideal of self-sacrificial love, and yet at the same time it offers an unforgettable sense of what true forgiveness is, ‘serene even to a fault’. Whenever one feels any impatience with Hill’s obscurity, or his massive withholding of judgement, or his simultaneous double-judgements, it would be as well to remember that at the very least his poems are, in both sense, ‘serene even to a fault’.